I love these end-of-year recaps. It’s so great to really look back over the year and see how I’ve improved, and all the places where I can do more work. I also love reading your annual recaps and best of lists, so please be sure to share yours in the comments. Best race experience in 2014: Even though I was injured, I would have to say the Gate River Run 15K. While I wish that I had been in better form, I loved absolutely everything about this race: the crowds, the spectator support, the course (ok, maybe not the Green Monster, but everything else), the volunteers. It was like a huge tailgate, but with running. I’m looking forward to next year, when I can redeem myself. Best run of 2014: Space Coast Half Marathon. 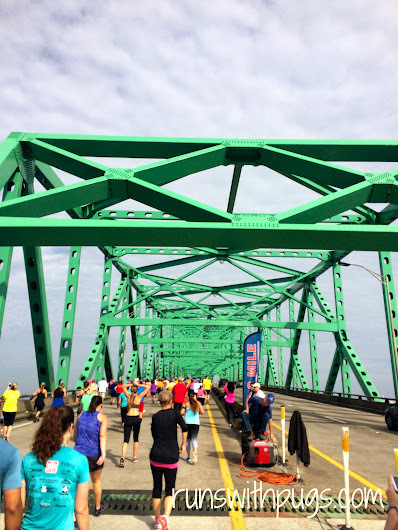 I felt prepared for the course and for the expectations of a half marathon. After so many months of summer training and struggling and being down on myself for not seeing any signs of improvement, I feel like I owned Space Coast. Not only did I earn a PR, but I felt fantastic during and afterwards. To me, that speaks volumes about my hard work paying off. Best new piece of gear: Mr PugRunner surprised me with a Garmin Forerunner 220. Goodness, I do love it. Best medal of the year: I mean, really? 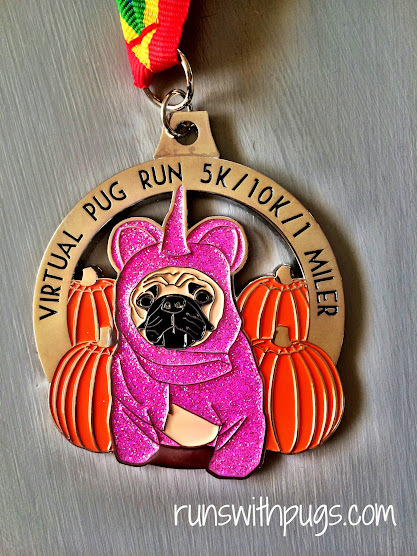 I love them all, but how do you compete with a sparkly pugicorn? You don’t. Best piece of running advice received: Run your own race. It’s hard not to compare and contrast and it’s so silly. It’s such a simple thing but it makes all the difference in the world in my attitude. Total number of miles in 2014: 573.43 (as of the writing of this post on 12/29). This is a few miles less than I ran in 2013, but I feel like I had better quality miles in 2014. 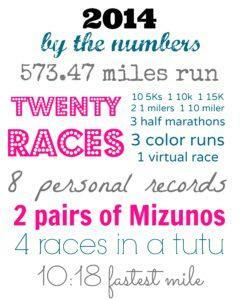 Total number of races: TWENTY! That breaks into ten 5Ks, one 10K, two 1-milers, one 10-miler, one 15K, three half marathons, three color runs and one virtual race. Wow. Total number of shoes: Two. 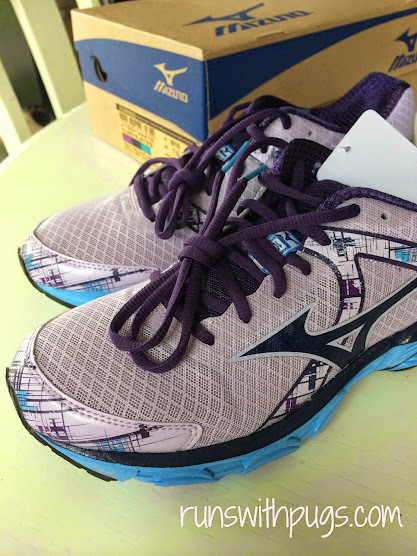 I am currently wearing Mizuno Wave Inspire 10s, and cannot wait to upgrade to the 11s after the marathon. They are supposed to be more like the 9s, which I preferred, and quite frankly, the colors are better. Because that matters. Worst running experience: Fortunately (I guess), this happened on a training run in the middle of summer. I was out for my long run and doing ok, but the heat, humidity and beating sun got the best of me. My stomach refused to cooperate, my calves seized up and I got very dehydrated. I couldn’t regulate my body temperature and ended up having to cut the run short and walk about a mile and a half back to the car. I felt awful and disappointed and defeated. Race I probably wouldn’t run again: The Marine Corps Half Marathon. Hands down. I wanted to like this race. I did. The course was somewhat familiar and I had been training like crazy. But the weather was awful (torrential downpour right before the gun, a delayed start and then steamy, humid, miserable heat), the false flats wore me down and the muddy stretch before the finish line were absolutely awful. I know it built character and taught me something about perseverance, but I don’t think I’ll be back. Race that surprised me: Tour De Pain. It was one of those things where I registered, and then pretty much worked myself into a panic about it. I’m silly that way. However when it was over, I felt so amped up and excited. It also pushed my comfort level to the max: I am way more of a distance/endurance runner than I am a sprinter, so laying it all out on the pavement for the one-mile sizzler was incredibly difficult. Run experience you to which you are most looking forward in the New Year: The Walt Disney World Marathon? I feel like I’ve been training for this so hard and for so long. More than half a year. It’s all going to come to a head and I think I’m excited about it. At least excited to have that bib and medal hanging on my wall. I’m also excited for my first relay at the end of January, and to take another crack at the Gate River Run, this time uninjured. The most important thing I took away from running this year: Consistency is key, as is listening to my body. I struggled a lot in the beginning of the year because of an injury and refusing to give myself permission to rest. Lesson learned, and I was able to come back (although slower than I should have). I did take some weeks a little easier than others to avoid burn out, but I was able to keep up a steady stream of training, and that has been so helpful. Most inspirational runner: This is so hard. I am so blessed to be friends with so many incredible runners. They have all taught me something, via their talent or their determination or their dedication or their kindness. I am so grateful for that. Here’s a quick breakdown for the year, just for fun. It wouldn’t be a year-end post without my goals for 2015. I did pretty well on my goals for last year, but I still have some work to do. Run this upcoming marathon with no regrets. I am 99.9% sure I am one and done and I want to walk away from the experience with my head held high. Get back into yoga. I did great for a while, but scheduling got in the way. My body will thank me. Improve my 5K time to about 30:00. This was in my sights last year, but I spent so much time building up my endurance and stamina for long runs that it fell by the wayside. I’ve got to shave about 3:00 off my time, and I think I’ll be able to handle that. Host a virtual run for a charity I support (pulling over from last year, as well). Feel free to play along by linking your own recap of 2014, share some of your highlights from the year, or post some of your 2015 goals in the comments. I’d love to cheer you on! Ohhh I love this post, it’s so incredible what you’ve one this year! I can’t wait to run Gate this year, I am all registered, hope we get the chance to meet in real life! We have GOT to meet up at Gate! No ifs ands or buts! I love an honest post that includes the great and not so great aspects to a running year. Your run that you would probably not do again was Marine Corps Half and I have a similar opinion of the Marine Corps marathon. I wanted to love that race, but I just didn’t. It was way too crowded at the start and I could not get my pace for more than 5 miles and it upset me! Ending on a high note though, I loved pacing Mitzie at her first half and of course qualifying for Boston at my home marathon. Here’s to a great 2015! Oh, I am nothing if not honest about running. There are going to be “those races.” And it’s a shame because I wish they were all great. Qualifying for Boston is AMAZING! I am so incredibly excited for you! Happy New Year! I love the Gate River Run as well. I can’t wait to run it again in March. I just bought some Wave Inspire 11s. I went straight from the 9s to the 11s, and I love them. I only feel a slight difference, but nothing that makes me hate the shoe. They say the 11s are really close to the 9s, and I loved my 9s. The 10s were ok, but I think I will be happier when I move to the next model. LOL! I wish I liked it more, but… it’s expensive (I need bells & whistles & fireworks, and that costs $), it takes so much time away from my family and I just don’t know that the emotional payoff is going to balance it all out for me. Never say never, of course, but I don’t see it as something I’ll be in a rush to repeat. 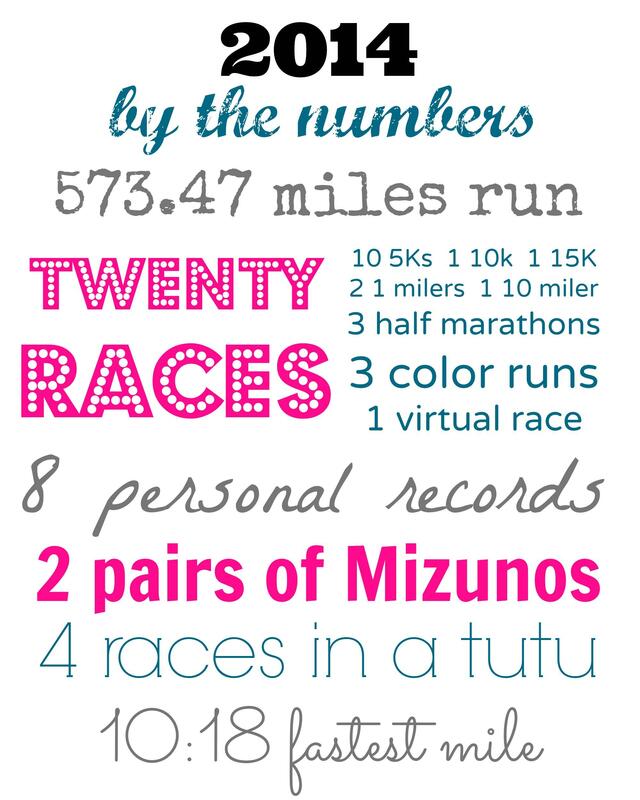 I’d rather savor the memory of The One and enjoy my 10Ks and half marathons! Wow, what a year! I can’t wait to hear about how the marathon goes for you; maybe I’ll even get the chance to meet you in person while we’re there! I hope so! I would love to meet you! It’s been a heck of a year. I’m so happy with how far I’ve come. Cannot wait to hear how Disney goes. You have a big 2015 ahead and it will be awesome. I hope it is! Thank you! What a year! It’s amazing looking back how much happens in just 12 months time, isn’t it?! I was going to steal your template and write my own running year in review, but I did a terrible job of tracking mileage this year, and really didn’t run many races. Maybe next year! I can’t wait to read about your marathon. I know you’re going to be awesome! Stacie recently posted…2014 in Review! You need to get on dailymile! Great way to track everything! Happy New Year! Thanks for all the support! great year! I too am committing to my yoga class weekly and I so want a 30 minute or less (like 29:59) 5K run! Glad we finally met! See you in a couple of weeks! I will take 29:59:5999999999999. I just want a 2 in front. Wow that’s a lot of races. Way more than I did. It’s been so much fun, this year. I hope to continue it.